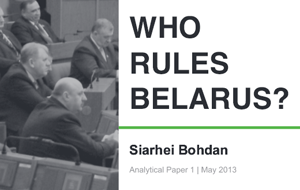 BelarusDigest > All > Analytical Paper: Who Rules Belarus? Over the last months the European press covered a wide range of Belarus-related topics starting from worsening economic dependence upon Minsk and the change in Minsk approach towards the West. The recent trial against Belarusian photographers and the market of selling visa appointments also drew attention of Western journalists. The "visa black market". The Polish daily Gazeta Wyborcza reports on the increasing problem of selling visa appointments in Polish consulates in Belarus. The illegal procedure has intensified with the increase of the number of Belarusians applying for visas to Poland. The consulates trying to facilitate the whole procedure implemented online application for visa appointments. However, new problems appeared. Hackers also decided to "accommodate" Belarusian applicants whose number last year reached the level of 350 thousand of applications. They can enter the system of the consulate illegally and block the system of free appointments for a month ahead. The applicants who did not manage to book the appointment can afterward purchase it even up to 100 Euro. The newspaper reports that according to some experts Belarusian state telecommunication company Beltelecom might be involved in the illegal activities. Minsk intends to normalise relations with the West? Aliaksandr Kudrytski argues on Bloomberg.com that Minsk is trying to improve the relations with the Western countries. The EU-Belarus relations cooled since the 2010 breakdown on the protesters after presidential elections. In the words of Alexander Lukashenka, "We don’t want to quarrel, we want good relations with you, but we also don’t want to bend our knees before you". According to the author, the Belarusian authorities made recently a few steps towards the European Union and the United States. For that matter, the Swedish charge d’affairs can return to Belarus after a last year teddy bear stunt, but also Prime Minister, Mikhail Myasnikovich, paid an official visit to Lithuania in August. Salami-slice strategy of Moscow. Who should save the Belarusian economy this time? EU Observer notes that the Belarusian authorities will probably need to sell out more enterprises to Russia in order to sustain the economy. And this will inevitably lead to deepening dependency upon Moscow, both economic and political. Threat of the "Russian hegemony" can make Minsk more prone to conduct a dialogue with the West. According to the journal, "the next few months are a good time for the EU to undertake negotiations with the regime and demand the release of political prisoners". Moscow uses the deteriorating economic situation and offers to purchase the profitable Belarusian enterprises, including Belaruskali, the Navapolatsk Naftan refinery and Minsk Wheel Tractor Plant (MZKT). The West has two options, another financial aid from the IMF, or support for modernisation within the policies of the European Union. Belarus-Russia military co-operation deepens. EU Business reports on the Russian plans to open the air base in Baranavichy in Belarus. Moscow wants to complete the project by 2015. According to the Russian Defence Minister, Sergei Shoigu, the first fighter jets will appear in Belarus this year. Both Minsk and Moscow go hand in hand as for political and economic co-operation. The journal reminds that over the last years the mutual relations also in the military sphere have significantly deepened. Russia has already installed a radar station and a navy radio station in Belarus. In the past they held also joint military exercises, what raised controversy among the Belarus’s western neighbours. This year the exercises will take place in September 2013 and Lukashenka commented as follows: "We are not hiding from everyone that we are the closest peoples and are trying to build a single policy". Belarus goes to the WTO? Sergei Kuznetsov writes in his FT blog about Belarus’s plans to join the World Trade Organisation. As the author notes, the Belarusian politicians, with Lukashenka at the top of them, have already expressed optimism about Minsk accessing the organisation in the near future. The Russian leadership has already suggested the organisation should become more open for negotiations with Minsk on this issue. Alexander Gurianov, deputy foreign minister, suggests that Belarus could join it in 2015. In the words of another politician, Andrey Snopkov, Belarus could join the WTO within one year if the US and EU “leave politics out of the process”. Russia remains today the only major supporter of Belarus accession to the WTO. Pictures in the court. Gazeta Wyborcza reports on the unprecedented process of the authors of the pictures for the ‘Belarus Photo Press 2011’. Belarusian court decided that the album "Belarus Press Photo 2011", which presented the best pictures recognised by the international jury, was extremist. The court decided about the confiscation of the whole circulation of the publication and prohibited its further corporation. The newspaper reminds that the KGB in Hrodna has initiated the case against the photographers, because "corporation of such pictures leads to creating the negative image of the state and humiliates the Belarusian nation". Another Polish daily Polska The Times adds that the court rejected the application of the photographers for another expert evaluation of the publication although the Independent Belarusian Association of Journalists had appealed before to the director of the Hrodna KGB for the withdrawal of the accusations concerning the album. Die Welt daily dealing with the same topic underlines that the album contained also completely apolitical pictures and scenes of everyday life. The newspaper refers to the case as "censorship as in the Soviet times". ARCHE is back. The Polish daily Rzeczpospolita reports that the independent opinion-making journal ARCHE received the permission for registration. The journal ceased to be issued since June 2012 due to the change of the editor what according to the Belarusian law required a new registration. Ales Pashkevich, a vice-editor, confirmed that the authorities rejected the journal’s registration already a few times, so he welcomes the recent approval. As in the past, Valery Bulkhakau will serve as the editor. Rzeczpospolita reminds that the problems of Bulkhakau began in September 2012, when he was presenting the book of the Polish historian about the Sovietisation of Western Belarus. The state-media started the campaign against him personally, but also targeting the journal ARCHE. Towards the strategic partnership. The Lithuanian Tribune reports on the record increase in economic cooperation between Belarus and Lithuania. According to the Belarusian Ambassador to Vilnius, Vladzimir Drazhin, for 2012 investment of both countries accounted for 273 million USD. It seems that the positive economic relations may the discussions over the local border traffic between both states. The ambassador Drazhin comments that "If such dynamics remains this year as well, these indicators will be definitely exceeded. I believe we can surely say that Lithuania and Belarus have reached the level of strategic partners".